Sammy's Pizza & Restaurant offers dine in or carryout pizza. Sammy's Pizza & Italian Restaurant in Green Bay is a great family restaurant. Although pasta is a large part of Sammy's Pizza & Italian Restaurant menu, pizza remains our most popular item. Like pasta, our pizza dough, sauce and sausage are handmade from family recipes. We use the freshest ingredients to complement our pizza offerings. The menu includes 14 specialty pizzas, 30 toppings should you wish to build your own pizza, and we are proud to use Wisconsin-made mozzarella cheese. My family was quite pleased to be invited by friends to stop by Sammy's Pizza for supper. It is known far and wide as a great old world pizza restaurant just a stone's throw from Lambeau Field. It was alive with activity as we arrived, obviously a choice many people make on Friday nights. We were seated immediately after being greeted with smiles and handshakes, and our adult and kids drinks were promptly served to us as we surveyed the menu. It has a wide range, from pastas to sandwiches to salads......but we were there for the infamous pizza ! We ordered 2 larges, a feast for 2 families, along with the garlic cheesebread to munch on while the chef worked on our handmade pizza. The atmosphere is definitely different than the "chain" pizza places......it is quite obvious this was a family owned and operated restaurant, a business that has been in the family for generations, and one the owners were extremely proud to put their name on. It was smoke free, with nice warm decor and servers who truly care about making your visit pleasant. Our pizzas arrived hot and bubbly, and were wonderful. The toppings were the distinctive feature....as you could tell the ingredients were fresh cut....not from a can or case. We definitely ate until we couldn't take another bite, and left with a full belly and a memory of a great supper with friends. We will definitely return to try their other entrees.......if we can resist their awesome pizza for just one visit !! I went to for dinner at Al Crispigna's Sammy's Pizza and Restaurant which is located in Ashwaubenon on the west side of Green Bay. Sammy's Pizza has been a local family tradition since it first opened in 1958 in downtown Green Bay on Walnut Street. In 1978 they moved to its current larger location on Oneida Street. As you first walk in the hostess and register area is in front and directly behind that to the right is the kitchen which is open with a long window where you can see the cooks preparing the food all decked out in bright yellow t-shirts. The dining area is on the left. It is a large open room with three main arch brick windows to one side. For seating there are booths which run along each side of the room and tables are set tightly together in the middle. In the center of the dining room is one massive vase filled with silk flowers, and on each end of the restaurant are two flat screen TVs hanging on the walls, although they were not turned on at the time. The atmosphere was comfy casual and very busy on this particular evening. The staff was bustling but also very efficient and friendly. Sammy's has a large menu selection with a full bar and wine list. I saw that they have frosted beer mugs so I ordered a beer and it came icy cold and tasted great in the frosted mug. I then ordered the 16 inch Sammys combo which consists of mozzarella cheese, green peppers, onions, pepperoni, sausage and canned or fresh mushrooms. I ordered fresh mushrooms and for $1.99 for each additional ingredient I chose to double the sausage, pepperoni, and fresh mushrooms, and I opted to skip the green peppers which came out to a total of $29.46. Considering how busy it was my pizza was brought out in a decent amount of time. 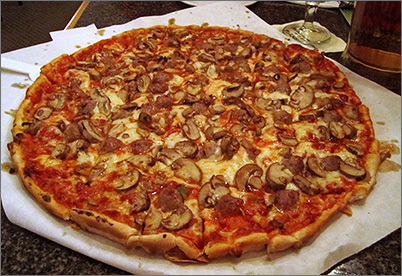 It is made on a thin crust with the pepperoni placed under the mozzarella cheese and the mushroom and sausage placed on top. There was a fair amount of ingredients but I expected far more since it was to be doubled. The crust was crunchy on the outer edge but soggy in the center, the mushrooms tasted fresh and were sliced on the thick side. I could not taste the onions, but the sauce had a very delicious flavor. If you like cheese Sammy's is the place to get your pizza for that is the one ingredient that was very prominent.